Hon'ble Governor of Kerala Shri. Justice (Retd.) 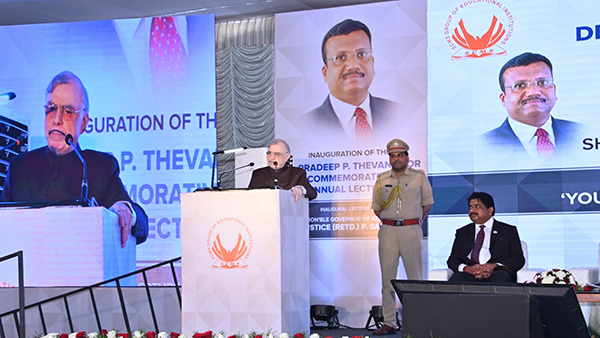 P. Sathasivam at the inauguration of the Dr. Pradeep P Thevannoor Commemorative Annual lecture enlightened the guests and the students about his valuable thoughts regarding the youth, the future of tomorrow. He started his speech by sharing his personal experience, which he had during his retirement days. After his retirement, he had decided to go back to his native place, which was a rural village area. During that time, the Indian Prime minister advised him to accept the governorship of either Karnataka or Kerala. He took a week to value his thoughts and he accepted the governorship of Kerala. That moment made him think about his school, college and teachers. He had also said that one should owe to the teachers more since they are the reason for your step by step growth. Even if one reach a higher position, he or she should never forget the ones who were behind them for their success. Our nation is blessed with 64% and above working population through which India gets demographic dividend, but the question is are we really ready for it or preparing for it?. It means that whether we have realised the true potential of our youth. "Flexibility of mind, spirit of adventure and eagerness to improve the past" is what required by the youth to create a better future. Social transformation can happen only if the resources and opportunities are fruitfully used including the "youth". There are some negatives which withholds this transformation such as immaturity and lack of responsibility. Youngsters are the leaders of tomorrow. To achieve or to excel in something, they have to face many hardships. Kerala had entered the top 25 percentile employable state because of the literacy rate of the youth. He also pointed out that the energy of the youth is being exploited by the violence happening across the country. He also advised that youngsters should involve into the social activities which triggers positive thinking. 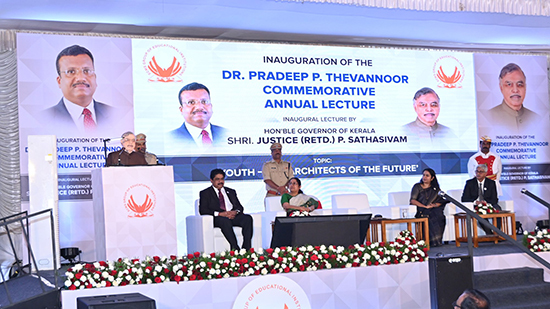 The best example was that of the active involvement of the youth during the time of Kerala flood which happened in the year 2018. They showcased their problem solving skills through the use of social media communication. Before concluding he shared a quote which was" Give a man a fish and you feed him for a day, Teach a man to fish and you empower him to feed himself and others" which was a very meaningful quote that gave a message that improving and developing the skills are necessary for creating a bright future ahead.